George Bush snuck some candy to Michelle Obama before his father’s funeral at the National Cathedral in Washington, D.C., Wednesday. Footage shows the 43rd President pulling a piece of candy from his pocket on his way down to the front of the cathedral to hand to the former First Lady. Bush stopped to honor the four other presidents in attendance and their spouses on his way to his seat in the front of the cathedral. 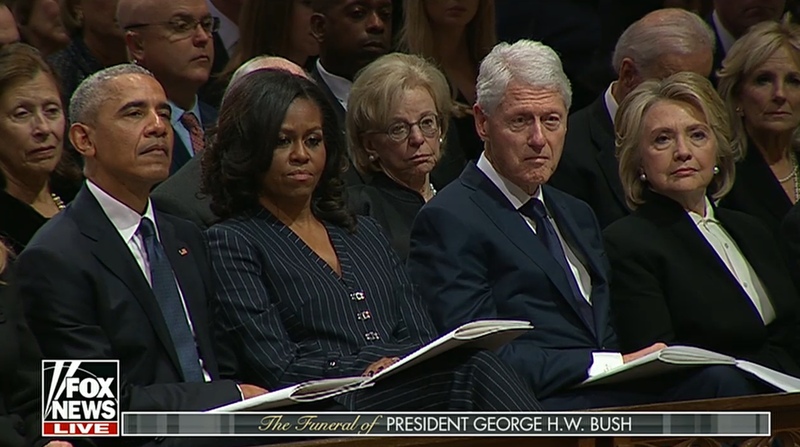 Carter, Obama, Clinton and Trump were all seated together, and W. Bush stopped to thank each one of them in attendance. In a sweet moment, Bush can be seen taking a piece of candy out of his pocket and handing it to Michelle Obama. Obama responded by thanking him, laughing and smiling. The last time the two met publicly, at John McCain’s funeral, former President George W. Bush again handed a piece of candy to Michelle Obama during the ceremony. The clip went viral. Since his presidency ended, Bush and Obama have had a warm relationship, often seen hugging or joking with together while in public.